Dean was born a preacher's kid (his Dad pastored in Michigan). He became a missionary's kid when his parents went to Costa Rica when he was five and then to Honduras when he was six. His family sang together and he learned to sing different parts by listening to his parents and singing with them as his voice changed through the years. He started playing the trumpet when he was in the sixth grade. He's been singing and playing gospel music ever since. After graduating from Bible college and seminary, he became an ordained minister in 1971. Ruth was born into the family of a Christian business man and lay preacher. She took piano lessons and by age twelve was playing for church services. 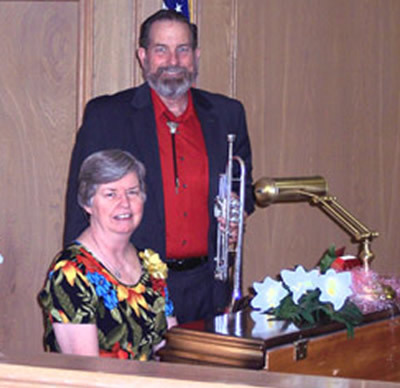 Dean and Ruth met at a missions convention and within a few months they were ministering in music together. Less than two years after they met they were married and have now celebrated over 40 anniversaries together. They have three daughters and eight grandchildren. The music ministry hasn't ever stopped. They started doing concerts about thirty years ago and have ministered in music in many churches, conferences, and events, in many states and in Honduras. They are members of the Gospel Music Artists Association and of the Southern Gospel Music Association of Texas.